– A movement toward a goal or further to a higher stage. –developmental activity in science, technology, etc., especially withreference to the commercial opportunities created thereby or to thepromotion of the material well-being of the public through the goods,techniques, or facilities created. In science, in cancer, we are always looking for the next best thing. The next best medicine, procedure or test as a way to prevent deaths from a disease or even to prevent the disease from occurring. That’s why we have clinical trials, to test out the latest and greatest theories and see how they work. Some of them fail, and we learn from those failures but some of them succeed. Like Tamoxifen, Herceptin. These are both example of incredible progress when it comes to the treatment of certain types of breast cancer. But sometimes, what one calls progress isn’t universally so. What I’m referring to is the American Cancer Society’s new mammogram guidelines. The changes are as follows. Women should start getting routine yearly breast exams starting at 45 years old. The old recommendation was 40. They also say that women can skip manual breast exams altogether. After age 55, women can switch to a mammogram every two years if their scans have previously and consistently been clear. The American Cancer Society sites a few reasons for this change. One reason is that a young woman’s breast is more dense than that of an older woman, making the detection of breast cancer much more difficult. Dense breast tissue shows up white and so do tumors. This creates more false positives in young women. In an article for CNN, one doctor said, “If she starts screening at age 40, she increases the risk that she’ll need a breast cancer biopsy that turns out with the doctor saying ‘You don’t have cancer, so sorry we put you through all this,'” Brawley said. Many women feel like this is a risk they are willing to take. What’s a few biopsies when, in the end you either a) have peace of mind or b) have been diagnosed with breast cancer but, hopefully it has been caught in time to receive life saving treatment. Acknowledging this, the ACS says that concerned women should get mammograms if they want to. They’re not saying, “don’t do it,” but they are saying that women can reasonably wait five more years. But what about all of those women who might develop breast cancer between the ages of 40-45? Or younger? What if, because they were not screened due to the new guidelines, their cancer is not caught in time for life saving measures but only life extending ones? This is the concern that many women have. This is where I have my biggest problem. This statement, in my opinion, further perpetuates the notion that women are not in control when it comes to their emotions, especially fear and anxiety. That we are fragile and not strong enough to handle the scary process that is required for our basic health. We are delicate flowers who can’t take the heat. Are women so frightened by cervical cancer that we refuse pap smears? I’m sure it happens but it’s not common. Just like I’m sure some women are traumatized by a false positive that could occur with a mammogram so they never go back again. But I like to think that most women, despite all of this, put their health first. I think that is what is true. I think that is the majority. Although I don’t have any statistics to back this statement up. It’s just my feeling about my fellow women. Let me tell you what is truly frightening about all of this. My fear is that without regular manual breast exams and mammograms, more women without a personal family history or genetic mutation will not get their cancer detected until it is too late. I’m scared that in the next few years we will see an increase in breast cancer mortality, especially in young women. So here’s my real problem. As of today, there is no effective tool for detecting breast cancer in young women, other than self breast exams. I’ll say this again, THERE IS NO TRULY EFFECTIVE TOOL for detecting breast cancer in young women. And the one way that we have, manual breast exams (which is how I found mine, by the way) they want to do away with! So, why instead of decreasing ways women can get screened is there not a focus on rigorous and early detection in women under the age of 40? I’m not saying this is easy. I’m saying it’s necessary. Being a woman in America just got a little scarier. But don’t tell the American Cancer Society. They just might set new guidelines so as not to paralyze us with fear. Young Survival Coalition’s response to ACS’s new guidelines. Categories: Uncategorized | Tags: American Cancer Society, breast cancer, mammogram guidelines, mammograms, manual breast exam | Permalink. Taking on cancer (and winning) one day at a time. Standing up to Lymphedema with all of your faith, power, and might. 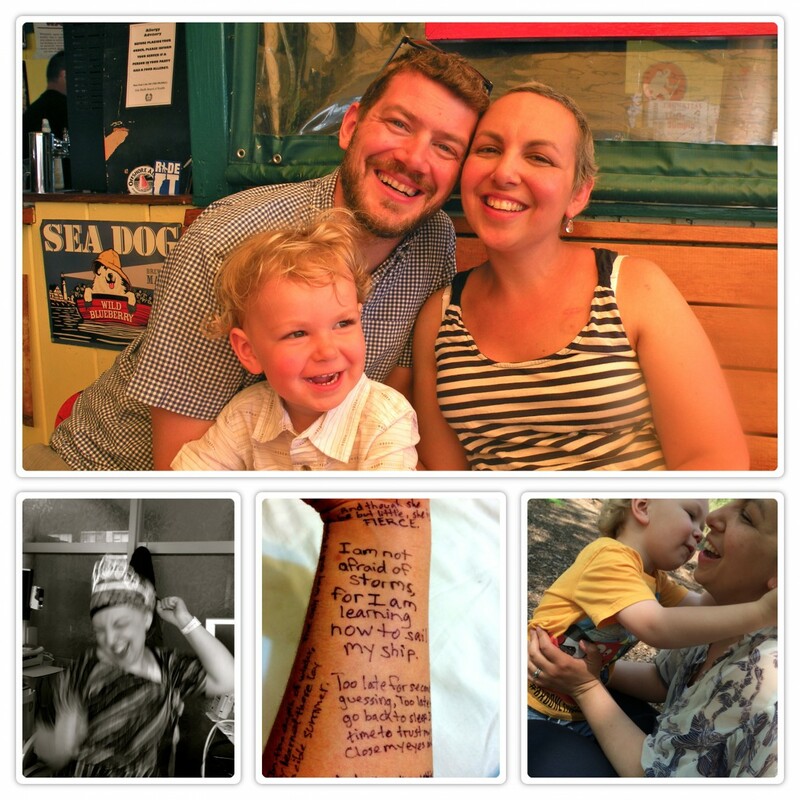 Beating breast cancer with love and laughs. Breast cancer will not define me. Stay strong. Stay positive. My journey of learning to dance in the rain. Cancer to Wellness in 1,038,769 Easy Steps!